The Purple Indian Bean (Catalpa x Erubescens 'Purpurea') is basically the purple leaved form of the Golden Indian Bean Tree, with which it contrasts well. 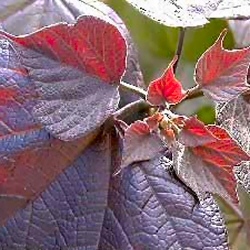 Its young leaves and shoots are a lush, attractive dark purple, almost black, gradually becoming dark green. We recommend this tree is planted in a sunny and sheltered position. A small tree, so expect a height of up to 4 metres (13 foot) after 10 years. Our Purple Indian Bean trees are supplied at a height of between 150 and 240 cm in a 7-20 litre container for year round planting.